Long before Rogue One: A Star Wars Story hit theaters last month, most box office analysts predicted that it would have no trouble winning the last three weeks in a row of 2016, with its reign possibly stretching into 2017 as well. So far, the analysts have been right, with Rogue One recently overtaking Captain America: Civil War as the second highest grossing movie at the domestic box office ($439.7 million) and seventh highest at the worldwide box office ($789.7 million). Entering its fourth weekend in theaters, it will go up against Sony's Underworld: Blood Wars as the only new movie in wide release, with limited release titles A Monster Calls and Hidden Figures also expanding nationwide. Even with this new competition, we're predicting that Rogue One will still find a way to end up on top of the box office heap this weekend. Even with this influx of new competition, following a weekend where no new movies debuted in wide release, none of these new competitors will likely get a wide enough release to give Rogue One a run for its money. Box Office Mojo reports that Underworld 5, starring Kate Beckinsale as Selene, will open in roughly 2,300 theaters, which is the same theater estimate for Hidden Figures' nationwide expansion. No theater count estimates were given for A Monster Calls at this time, but if it opens in the same amount of theaters, it will be roughly 1,857 theaters shy of Rogue One's 4,157 theater count, which has remained unchanged since it opened on December 16. It's possible that Rogue One may lose a few theaters this weekend, but that shouldn't stop it from winning for a fourth weekend in a row with $26.2 million. Rogue One dropped only 22.6% in its third frame last weekend, when it took in $49.5 million, but it should drop a bit more this weekend, with this added competition. We're predicting that Sing, Universal's hit animated musical, will remain in second place yet again with a projected $21.6 million, followed by A Monster Calls with $16.8 million, Underworld: Blood Wars with $14.6 million and Hidden Figures with $13.7 million. If these projections are accurate, it will mark the first time that an Underworld movie has not opened with more than $20 million. 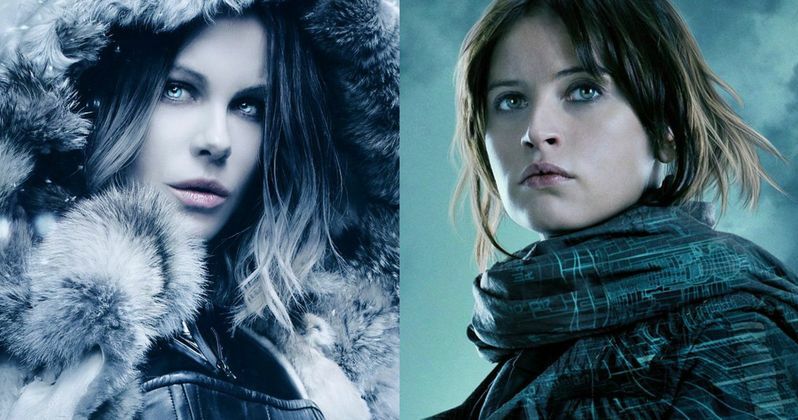 However, the first four films have opened in anywhere between 2,900 and 3,200 theaters, and with the 2,300-theater estimate for this movie, Underworld: Blood Wars should open a bit lower than its predecessors. The next installment in the blockbuster franchise, Underworld: Blood Wars follows Vampire death dealer, Selene (Kate Beckinsale) as she fends off brutal attacks from both the Lycan clan and the Vampire faction that betrayed her. With her only allies, David (Theo James) and his father Thomas (Charles Dance), she must stop the eternal war between Lycans and Vampires, even if it means she has to make the ultimate sacrifice. Kate Beckinsale leadsd a cast that includes Theo James, Lara Pulver, Tobias Menzies, Bradley James, James Faulkner and Charles Dance. Anna Foerster directs from a screenplay by Cory Goodman. A Monster Calls centers on 12-year-old Conor (Lewis MacDougall), who is dealing with far more than other boys his age. His beloved and devoted mother (Felicity Jones) is ill. He has little in common with his imperious grandmother (Sigourney Weaver). His father (Toby Kebbell) has resettled thousands of miles away. But Conor finds a most unlikely ally when the Monster (portrayed by Liam Neeson in performance-capture and voiceover) appears at his bedroom window one night. Ancient, wild, and relentless, the Monster guides Conor on a journey of courage, faith, and truth that powerfully fuses imagination and reality. Juan Antonio Bayona directs from a screenplay by Patrick Ness, based on his own novel of the same name. Hidden Figures is based on an incredible true story about three women who helped the U.S. win the "Space Race." As the United States raced against Russia to put a man in space, NASA found untapped talent in a group of African-American female mathematicians that served as the brains behind one of the greatest operations in U.S. history. Based on the unbelievably true life stories of three of these women, known as "human computers", we follow these women as they quickly rose the ranks of NASA alongside many of history's greatest minds specifically tasked with calculating the momentous launch of astronaut John Glenn into orbit, and guaranteeing his safe return. Dorothy Vaughn, Mary Jackson, and Katherine Johnson crossed all gender, race, and professional lines while their brilliance and desire to dream big, beyond anything ever accomplished before by the human race, firmly cemented them in U.S. history as true American heroes. The top 10 will likely be rounded out by Passengers ($8.7 million), Moana ($7.2 million), Why Him? ($6.8 million), Fences ($6.1 million) and La La Land ($5.8 million). Also opening in limited release is Film Movement's The Ardennes, IFC's I, Daniel Blake and Well Go USA's Railroad Tigers. It remains to be seen whether or not these films will expand in the weeks to come. Looking ahead to next weekend, three more movies will debut, while three more will expand nationwide. Paramount's Monster Trucks, Open Road Films' Sleepless and STX Entertainment's The Bye Bye Man will debut in theaters, while Warner Bros.' Live By Night, Lionsgate's Patriots Day and Paramount's Silence will expand nationwide. Take a look at the top 10 projections for the weekend of January 6.